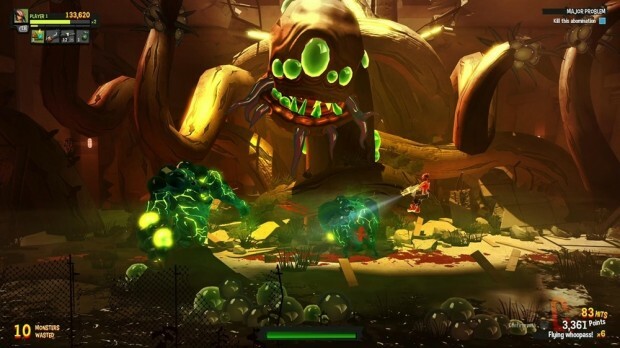 Final Exam was developed by Mighty Rocket Studio and published by Focus Home Interactive. It was originally released on November 8, 2013 for $9.99. A copy was provided for review purposes. Final Examis a game that feels dated from the start. 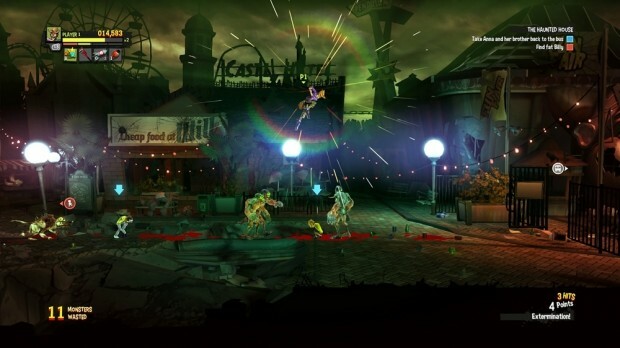 The zombie setting feels like an overused trope here, decided upon not because of any significant meaning to storyline or gameplay mechanics, but because zombies were popular at the time the game was being developed. 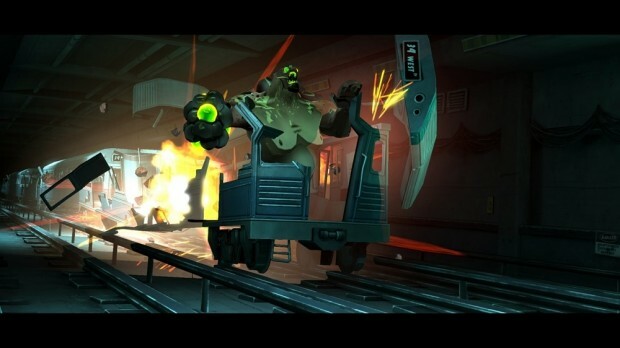 Any game that casts a group of four people working as a team against zombies is going to owe something to Valve’s Left 4 Dead; Final Exam, owes a little too much — the first boss is called the Tank and looks like a ripoff of the monster from Valve’s popular first-person shooter. The game runs at 30 frames per second, which makes everything feel just a little slower than it should. There’s a neat idea or two to be found here, but nothing that adds up to a game worth any significant investment of time. Playing with depth in two dimensions — Final Exam does a good job of utilizing multiple layers of depth as you navigate the environment. Run past a staircase and it seems like part of the background, until a player realizes it’s possible to switch layers and instead choose to walk down that staircase. It’s a neat gimmick that many more games should be making use of. Some of the end-of-zone encounters force players to pay attention to the background — for instance, the first level’s close places players on a train car in the face of oncoming pipes and signs that will kill both the player and enemy zombies if they are standing in the wrong part of the train car when they cross the plane of the oncoming train. It would have helped the combat immensely if the guns had worked the way they do in the spectacular Shadow Complex, allowing players to aim across layers of depth, but alas, they do not have that functionality in Final Exam. Repetitive, broken combat — Beat-em-up games like Final Exam need fun, engaging combat in order to be enjoyed over the long term. Unfortunately, the combat in Final Exam has a number of problems. 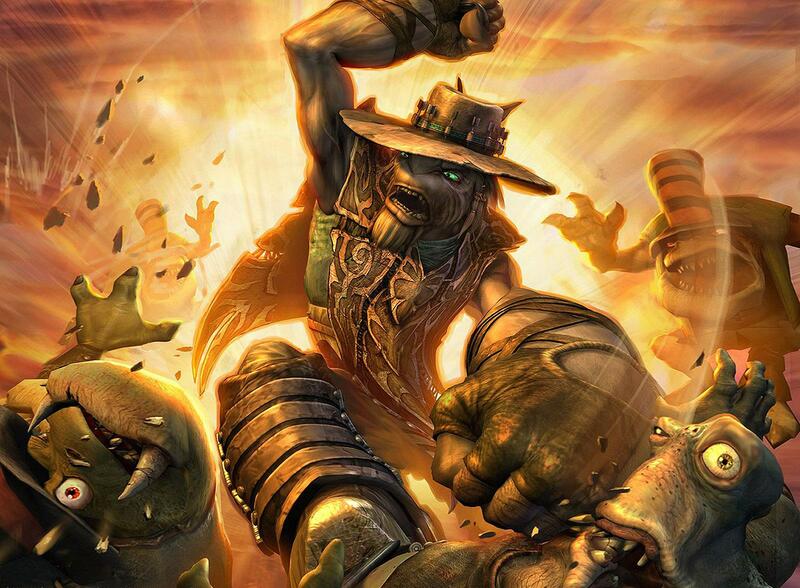 First and foremost, it almost never feels satisfying — you just thwack, shoot or grenade enemies until they die. The standard three-hit melee combo doesn’t significantly stun or knock back adversaries, making the playable characters feel weaker than they are. There’s also a ground smash move and an upward swing that both work on enemies after they have been knocked down, which means that killing any standard zombie is simply a matter of repeatedly hitting down+X until it dies (or if using a weapon that lacks a knockdown on the ground smash, rotate up+X, down+X). What should be the most exciting part of the game quickly feels like a waste of the player’s time. Stereotyping in character design — Final Exam features egregious character stereotypes. While that’s a games industry problem reaching far beyond Mighty Rocket’s beat-em-up, under no circumstances in the year 2013 should a game’s only female character’s ultimate skill be looking so hot that the zombies won’t attack her. Other characters are not as obviously problematic, but game design should move onward from casting the jerk of a football player as the strongest character, the nerdy guy as the one good with explosives, etc. Again, this is a broad complaint, but any readers with any level of sensitivity to these issues are going to leave Final Exam sessions with bitter tastes in their mouths. Backtracking — The main path through the levels requires a significant amount of backtracking. This isn’t always an issue, but because players don’t know in advance when a level is going to end, it is difficult to decide when to step away from the main path and look for the (nearly required, since they are tied to statistical upgrades) bonus items scattered throughout each of the game’s stages. Having bonus items is a plus, but leaving players confused about when they should be looking for them isn’t. Overall, Final Exam is a game playing on far too many tropes that have already run their course. While zombies and beat-em-ups are both going to remain popular, the bar is moving ever upwards, thanks to some brilliant games released over the past few years. The Walking Dead wasn’t a great game because it had zombies; rather, it was a great game because it told a story that many people connected with, and because it made us care about the characters inhabiting the world that Telltale created. Similarly, in a world where Castle Crashers, Scott Pilgrim vs. the World and Charlie Murder are all competing for your money, there is little room for a brawler with lackluster combat and unrelatable characters.